This template helps you improve CTR by finding which pages could benefit from an updated title tag and meta description. High rankings are great right? Course they are. But what if you are ranking your pages, but no one seems to be visiting them? SEO isn’t just about ranking your pages. Some would say search ranking positions are just a vanity metric. But that’s a whole can of worms for another day. If not enough people are clicking your search snippet, you need to fix up your CTR. Organic CTR (click-through-rate) is the percentage of people who click on your site in the SERPs. CTR, rankings and traffic are all connected. Data suggests that improving your CTR by just 3% will move you up the rankings. It’s also a great way to get more traffic without writing any more content. SEO metadata is a way for your website to talk to Google. It’s what appears in the SERPs and it lives behind the scenes in the HTML of your pages. You can also scroll down to your CTR at a page or query level. But who’s got time to scroll? Panic not fellow lazy marketers, you can pull all this data right into a Google Sheet with a few simple formulas. When it comes to optimising your SERP snippet, as I’m sure you know, there’s two elements you want to focus on: Title Tags & Meta Descriptions. Google Search Console setup for your site. Search Analytics for sheets add-on installed. Screaming Frog to grab your titles + metas. So you’ve made a copy of this sheet. You’ll need Search Analytics for Sheets installed to start. 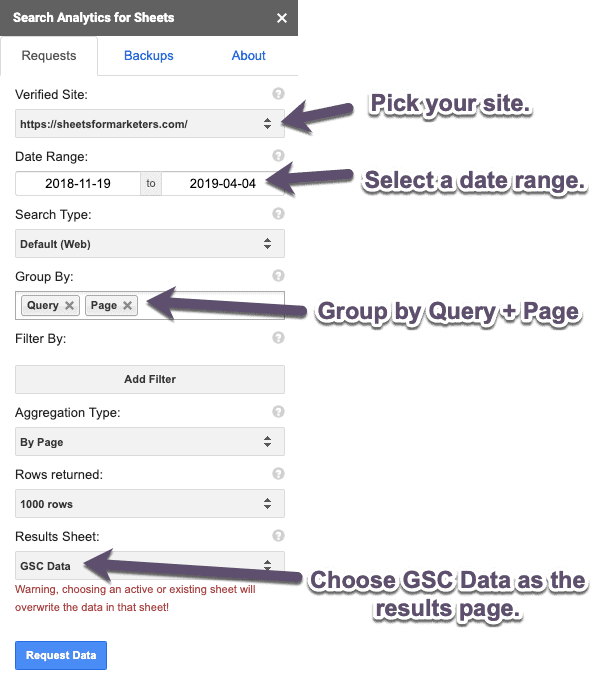 Choose GSC RAW as the results page. NOTE: Limiting the Rows returned to 1000 rows is optional. Pulling in all the rows for a big site can slow down a sheet. Once it’s setup like that, hit  Request data. Now you want to get your current on-page optimisation in the sheet. Put your website in and hit start. When it’s done, export your results and paste them into the SF Export tab. Now the sheet will do it’s thing (using the magical Query function) and combine the data from Google Search Console with your on-page SEO (cheers Screaming Frog & VLOOKUPs). Give it a few minutes to load then head over to the “Analysis” tab to see which pages could use updated metadata. So you’ve found your improvement targets, now what? Well it’s now time to improve our page titles and metas. Your page titles and meta descriptions are key to telling users (and Google) what they will be getting from your website. You want metadata consistent with the topic of your site. Tell people what they can expect from your content (your value proposition). The takeaway from optimising your page titles and meta descriptions: nothing is set in stone. Test, monitor & adapt. See what works, then do more of that. Don’t forget to grab a copy of the sheet here to help you improve your organic CTR. Also, checkout the directory of Google Sheets templates to help you automate other SEO tasks.